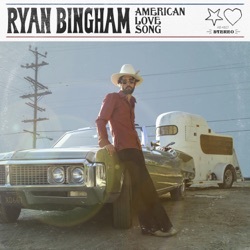 American Love Song is the sixth studio album by Ryan Bingham, released by Axster Bingham Records on February 15, 2019. The open roads of 2007’s “Mescalito” led the resilient troubadour to this, his most consistent — and consistently interesting — album since then. Crisp, introspective and never self-indulgent (a very real fear when the artist owns the label) it is a consciously amazing work that is bound to further the fame of Mr. Bingham. Ryan Bingham has delivered that consistently impressive record that we all knew he had in him. It's his most confident since his brief flirtation with the mainstream at the dawn of the 2010s. The result is an album that’s an early frontrunner for best release of the year, one that fully delivers on all the potential Bingham first displayed over a decade ago. Nothing short of an ingenious horizon expansion. Ryan Bingham’s upbeat Americana exhibits an irrepressible spirit. A wonderful 15-song journey through folk, rock, country, and blues. On "American Love Song" RYAN BINGHAM succeeds an impressive balancing act between the political, autobiographical and spiritual spheres. American Love Song expertly and movingly shows how the overarching U.S.A. theme can encompass triumph and tragedy from one moment to the next. Amazing artist If this first song is any indication this album will be as epic as all of the others. Ryan is a rare find in the music world. Soulful and heartfelt, he brings music that that tells a story in a beautiful way. Great Storyteller Heard his music on TV and immediately purchased his albums. Love his emotion and honesty in song.